Deep reductions in energy use and carbon emissions will not be possible within political economies that are driven by the capitalist imperatives of growth, commodification and individualization. As such, it has now become necessary to understand the relationship between capitalism and the emergence of high energy habits. 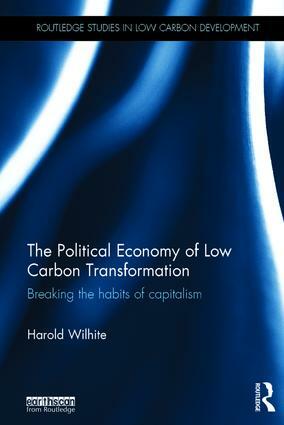 Using the examples of home energy, transport and food, The Political Economy of Low Carbon Transformation articulates the relationship between the politics of economic expansion and the formation of high-energy habits at the level of family and household. The book elaborates a theory of habit and how it can contribute to this relationship. It critiques mainstream green economy and green energy prescriptions for low carbon transformation that take economic growth for granted and ignore habits formed in a material world designed and built for high energy use. The book explores the growing number of communities around the world that are engaged in collaborative efforts to reform their community and household habits in ways that are less environmentally intrusive. It assesses their potential to make an impact on national and urban low carbon political agendas. The book is aimed at a large and growing interdisciplinary audience interested in the relationship between political economy, consumption and sustainability. Harold Wilhite is Professor of Social Anthropology at the Centre for Development and the Environment, University of Oslo, Norway.